Go See This Contributor Richard Gorick sat down with Mark Reed and Tom Durrant to learn more about Not Even Theatre's debut production, Talk. 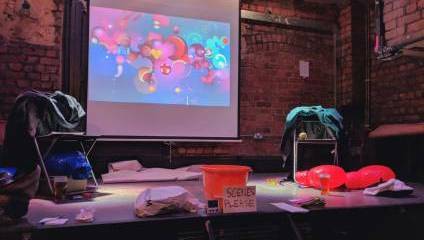 Manchester’s bustling theatre scene welcomed its newest company this month with the launch of Not Even Theatre, and its debut production, Talk. The show blurs the lines between experimental theatre and physical comedy as it takes a sideways look at many of the norms of modern life, particularly those involving the media. Stripped of their original context, the absurdity of simple things such as online comments and internet searches are highlighted, as the show’s use of audience participation to decide what will be performed next brings to attention the many meaningless rituals we perform every day, as well as allowing for some increasingly silly humour on-stage. Go See This contributor Richard Gorick spoke to Not Even Theatre’s founding members, Mark Reid and Tom Durrant, ahead of their show Talk, which is being performed every Tuesday at The Eagle Inn as part of the GM Fringe throughout July. You have both worked together in the past, so why did you decide to launch a new theatre company? Tom: We have lots of ideas we think are interesting, and then we ask, ‘is this actually interesting?’. The answer is usually no, but this time it was yes, so we made a show. Mark: It’s a break from what we’re done previously. There’s an awful lot of theatre programming, when you have these background meetings all about branding and building an audience, and I think companies can get obsessed by that. We were more interested in making the show something different, something we wanted to do. We didn’t want to get distracted by making something which people expected of my old company. Tom: If the show we wanted to do was already out there, we’d have just gone and watched it. It’s a lot easier to watch a show than make one. If a show’s already out there, what’s the point in rehashing it? Just go watch it. Mark: It isn’t like anything I’ve ever come across, and it’s something I think I’d enjoy experiencing as an audience member. That was the touchstone for what we wanted to do, there was no issue we wanted to raise, it’s more just about the performance. Tom: It’s a nice break from past shows which have been quite heavy, whereas this is nice, it’s a bit silly. There’s nothing you have to think about too deeply, you can if you want, but it’s also a show you can just watch with a beer and have a laugh. Mark: We wanted to do things we’d never done before and that we wouldn’t normally get a chance to do. I doubt there’s any other circumstance where I would get to mime to a Tom and Jerry cartoon. Tom: The show’s a lot of things really. Does the audience have more choice with this show in terms of content? Mark: The audience does have some input in terms of what they want to see. Would you say they have more power with Talk than they would with other shows? Tom: They have a lot more power. I think a lot of audience participation shows set random boundaries for no real reason, whereas with this we have a set time of 30 minutes and selected scenes so it’s easier for people, but apart from that, they have the freedom to choose what they want to see. Mark: Audience participation is a weird thing because most audiences don’t want to participate. They need to be prompted, we needed to work out what those prompts could be without the whole show descending into chaos. Tom: I think in the case of Talk, there’s incentive for them to participate. I think they end up with a sense of ownership of the piece, because if there’s something they like they can vote to see it again. Mark: If we wanted to be really pretentious about it, we could say it’s a comment on contemporary democracy as the they can vote but only from a small selection of scenes. Mark: Get what you want. Tom: You may never get what you want. Tom: (Laughs) Yeah, we definitely planned it to be that deep. What’s next for Not Even Theatre? Mark: Well, Ken Campbell did a 23 hour show In the 70s, it was a huge hit, so I think we need to try expanding our running time. Tom: We’re done a 30-minute show, a shorter one, now we need a really long one. You’re tried audience participation, now you want to test audience endurance? Tom: To be fair, this tests the audience endurance a little bit, (laughs), but they can leave if they don’t like it. Mark: You can think that you’ve produced something that’s really interesting and profound but ultimately if the audience don’t like it, it’s their choice. Do you want the company’s identity to continue to be in flux? Tom: I think so. If you ever expect us to do something, that’s not what we’ll do. We don’t want a Not Even Theatre style. Which is difficult from a marketing perspective, but I never said I was a marketing consultant, I’m just a theatre maker. Mark: There’s no long-term plan. Anything could come out. It’s a bit of a pop-up company. Tom: We want to test new ideas and new work. Mark: And then people don’t come with expectations, which means they can’t be disappointed. Tom: I’m sure they can (Laughs) but that’s on them for building up expectations in the first place. I mean originally, I wanted to produce my own work rather than be told what to do, and now…. You’re getting the audience to tell what to do instead? Tom: Now I’m telling the audience to tell me what to do. Mark: We don’t want to create an awkward situation for the audience. I don’t want our show to be like when you go into one of those small shops, and you don’t feel you can leave unless you buy something. Tom: Well, we can set up something, so they can buy stuff. Mark: We could make t-shirts. Tom: Here’s my opportunity to preach. There’s a lot of work out there, go and see something interesting. Whether you think our show is interesting or not, go out and find something which is a bit different, something that you’re not seen before, and just give it a go.